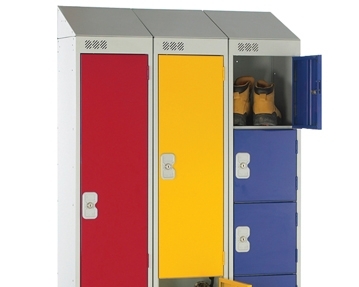 Sloping top lockers are a great way of storing equipment in the workplace in a safe way. They keep clutter out of the way and everything in its place. The sloped design of these structures means that items can’t be left on top where they might fall and pose a hazard to workers and visitors. They also prevent litter being left on top, making cleaning easier. At Furniture At Work, we know it’s important that storage facilities are just right for your work environment. Otherwise, you might end up with too much or too little room. 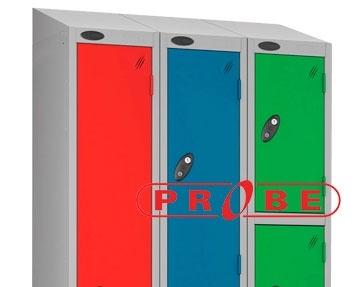 We allow you to customise your workplace lockers by choosing the dimensions, number of compartments, number of nests, lock type and colour. 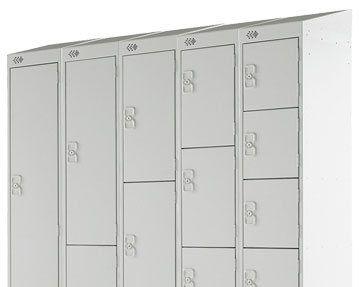 All of our sloped top lockers are robust, scratch resistant and are designed to prevent bacteria from growing on them, meaning they should stay functional, attractive and clean for longer.